The French capital will offer the opportunity to learn more about two important exponents of Made in Italy: the architect Gio Ponti and the company Olivari. The long career of the Italian architecture master Gio Ponti will be put on display in a long-running retrospective: “Tutto Ponti, Gio Ponti archi-designer”, organized by the Musée des Arts Décoratifs, curated by Olivier Gabet, Dominique Forest, Sophie Bouilhet-Dumas and Salvatore Licitra, in collaboration with “Gio Ponti Archives”, from October 19th, 2018 to February 10th, 2019. The exhibition traces the master’s long career, from 1921 to 1978, highlighting all the aspects of his work and his complex figure of architect, designer and eclectic creator, through more than 500 pieces, including three handles for Olivari . 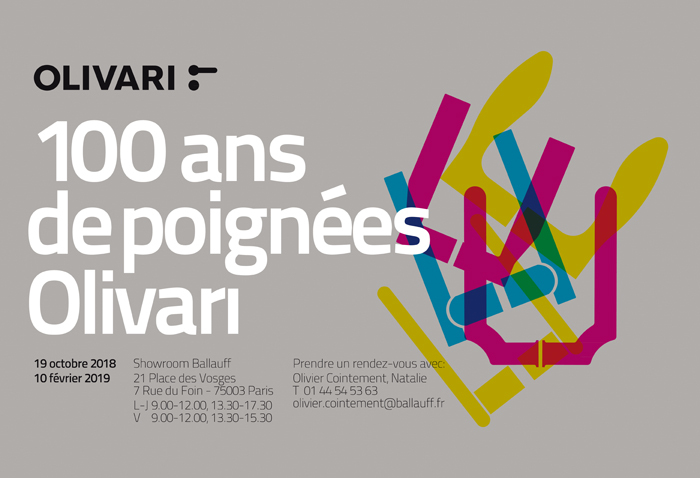 In the same period, the Ballauff Showroom (21 Place des Vosges, Paris), a historical reality located in the heart of Paris and Olivari distributor in France, will host the exhibition “Olivari, 100 years of handles”. A first part of the exhibition will highlight the handles made from the ’30s to the’ 70s, born from the collaboration with the architects to comply with a consistent completion of their buildings. The handles of Marcello Piacentini, Angelo Mangiarotti, Ignazio Gardella, Studio BBPR, Marcello Nizzoli, Sergio Asti, Franco Albini and Franca Helg, Luigi Caccia Dominioni, Vico Magistretti and Magnaghi and Terzaghi, Joe Colombo will be exhibited. There will also be the three handles designed by Gio Ponti for Olivari in 1956: Lama, Cono and Anello, whose original prototypes will be displayed. In the second part we will talk about the handles made up to our days, designed by the most important international architects and designers, including: Rem Koolhaas, Zaha Hadid, Ben Van Berkel, Jean Nouvel, Dominique Perrault, Toyo Ito, Steven Holl, Daniel Libeskind, Piero Lissoni, Rodolfo Dordoni, Patricia Urquiola, Vincent Van Duysen, who wanted to express their personal trait in a small “architecture taken by hand” which is the handle. An exhibition which allows to understand the special relationship between Olivari and the world of design and which highlights the extraordinary bond between the company and some international designers along with the magnificent achievements born from these special meetings.